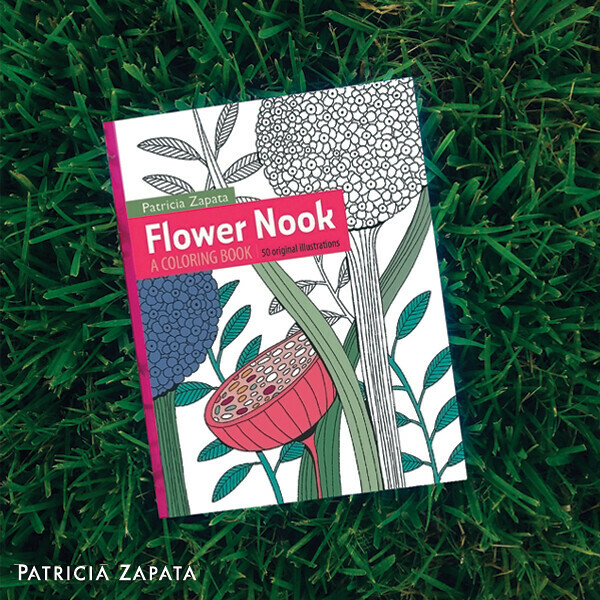 A Little Hut - Patricia Zapata: flower nook: a coloring book is now available! flower nook: a coloring book is now available! Look what I have to show you today! I'm so happy that Flower Nook: A Coloring Book is ready to go into the world. I still marvel at the idea it all started with some simple sketches I posted on Instagram. Several people asked me if my illustrations were available for coloring and here I am. The process of creating the 50 illustrations in the book took about two months. My sketchbook was my main source of inspiration and if you've been following me there you'll see the connection right away. I also remembered childhood fantasies where I wondered what it would be like to be tiny (like Thumbelina) and walk through blades of grass that were twice as tall as me and being surrounded by enormous flowers. That's why I included about 5 illustrations that have little girls enjoying the flowers and tending to them. I truly hope you enjoy the book as much I did creating it. I got silly excited when I got my proof copy in the mail. Ha! It reminded me a bit of what I felt when I got my first book. It never gets old. This project confirmed (yet again!) that I love working on ideas that my customers can take to the next level. Whether you're building something out of paper or adding color to pages, you're contributing your own dose of creativity and that thrills me. Hopefully, you're also having as much fun as I have when I'm working on all this – it truly is a joy to do what I feel I was born to do. Thank you so much to those of you that have been so encouraging during this process. Special thanks go to my amazing (patient!) family, to Jenean Morrison for sharing her expert advice and Natalie Barsalou for helping me name the book. You can order your copy of Flower Nook: A Coloring Book on Amazon. As always, thank you so much for supporting my work! Felicidades Paty! Por supuesto que de inmediato voy a encargar tu libro y sé que lo voy a disfrutar muchísimo. Abrazos desde México. Congratulations PatricIa, I wish you much success.